Android phones are being promoted as smartphones which don't bother about security much. So they let you be, break the limits and allow you to be above and beyond the rules and boundaries. Well, to an extent it does hold some truth and we know all that. 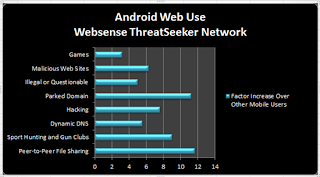 And a research conducted by Websense seconded it. The research basically shows that Android phones are not really security conscious as opposed to their fellow Apple iPhones. Websense did the fieldwork and collected data to prove this and showed it to us in numbers how true the fact is. This study reveals that Android phone users are more interested in the phone and its features and how they can make the most use of their phones rather than being constantly pestered with the thoughts of getting their phones infected by virus due to free downloading and sharing of files and applications among themselves or on the web. On the other hand, Apple iPhone users can only download stuff from their authorized app store which obviously keeps the software of the phone secure but where is the fun in that when they can't even download all the apps just because they are not free or not available on their app store at all. To overcome this problem, they jailbreak their iPhones, now where is the morality in that? But there are very few people who jailbreak their phones. The rest just sit and put up with whatever limited options they have. Well, what do they have to choose from? Lets see, angry birds and angry birds and angry birds, they can choose any. And when it comes to Android phone users, they download whatever they like from wherever they like, regardless of what security issues they might bring to the phone. So as long as security issues are concerned, Apple does ensure that for you but then, where is the fun in that? 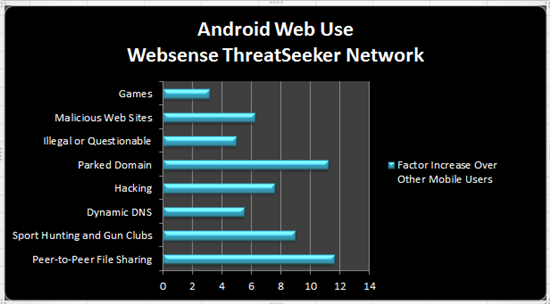 0 Respones to "Less Security Concerns For Android Users Compared To iOS users(REPORT)"